Bound Gravel is a high-performance SUDS compliant, porous aggregate bound system. Available in a range of colours and blends, the gravel surface is extremely hard wearing and provides visually stunning finishes. Unlike block paving, bound gravel is slip-resistant, weed resistant, and does not sink under extended use. This makes it the ideal, low-maintenance surface for driveways, pathways and walkways. Resin Bound Gravel is bound with resin to form a smooth, natural appearance. Coloured gravel can be used to incorporate graphics and designs or to match exterior masonry. After months of testing the BBA have endorsed the system for its high strength, SUDS compliance, and its excellent track record. Installers arrive on site wearing full PPE and sign in if required. Once equipment has been unloaded, installers measure area, take photos, check dips and report temperature. The area is then dried with a gas lance and cleared of leaves and debris. Edges are primed twice. Materials are mixed with a resin-binder and transported by wheelbarrow to the area for laying. The mixture of gravel and resin is levelled to the required thickness, and a screed, roller or hand trowel is used to smooth and lightly compact the surface to gain an even, level finish. The surface is ready to use the following day. 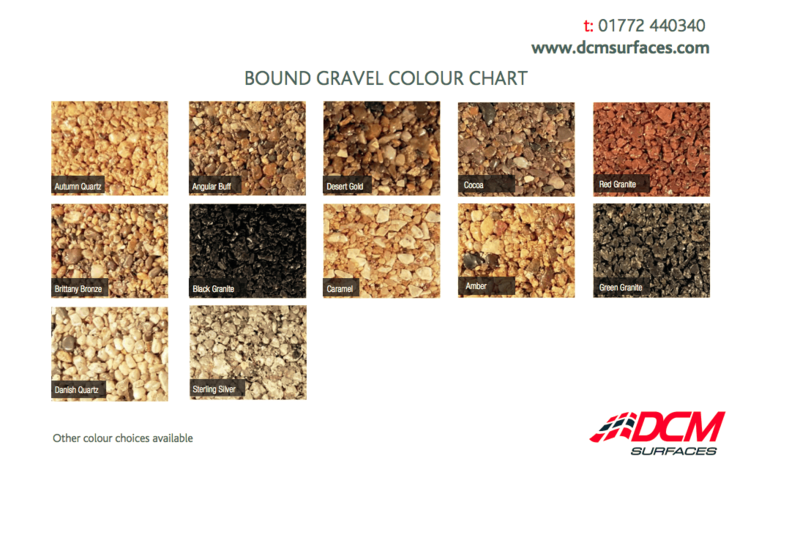 Gravel is available in a variety of colours. Bound Gravel is a low maintenance product. However, it should undergo routine and operational inspection and maintenance to keep it in optimum condition. Q. What is the difference between Bound and Bonded gravel? Bound Gravel is smooth and porous, Bonded Gravel has a rough surface that is not porous. 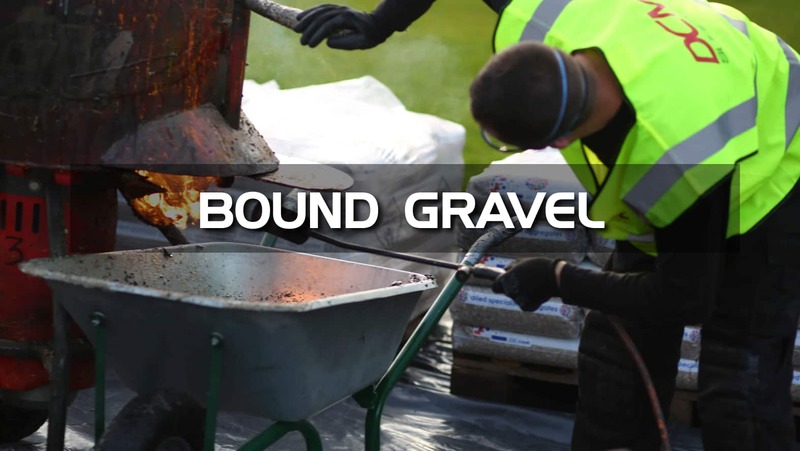 Watch the Install Videos to see how Bound and Bonded gravel systems are created. Q. Will the surface always be porous? A. As with all new surfacing, maintenance is key. Resin drives should be swept regularly of leaves to avoid a build-up of debris. Q. What can resin bound surfacing be laid on? A. Resin bound surfacing can be installed onto min 50mm AC14 open texture binder course. Q. Is resin bound surfacing strong enough to take vehicles? A. Yes, the stone and resin used is extremely hard-wearing, so it can be used by vehicles. Q. What size aggregate is used for the resin bound surfacing? A. Normally a 1-3 / 2-5mm sized aggregate would be used for a driveway, terrace or path. This ensures that the internal makeup of the surfacing is a tight, well-bound mixture, with the right amount of cavitation for permeability. This would be laid at min 20mm depth for a driveway, and min 16mm for a path or terrace. For tree pits, we would recommend a 5-8mm or 10mm sized aggregate to achieve optimum strength and porosity. Q. What will happen to resin bound surfacing during times of extreme heat or freezing? A. As the resin bound surfacing has cavitation within the mixture, water will run through the surface and back into the ground. This stops water from pooling on the surface, so causing a freezing problem. During times of extreme heat the resin bound surface will remain cooler than asphalt or concrete, due to the cavitation allowing air to circulate through it.